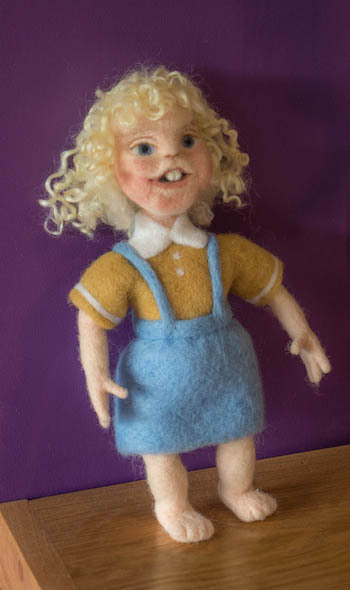 Have you experimented with needle felt yet? It is becoming a popular craft, but just what is it and how is it done? The basic principle couldn't be simpler - you scrunch up the wool, lay it on the foam and stab it with the needle. As the needle enters the wool, it catches the fibers and tangles them together, creating a compacted mass which you can shape and sculpt. The wool compacts in the direction you poke the needle, so you can form shapes by varying the angle. It is important to always bring the needle back out at the same angle, to avoid the risk of breaking the tip. Use the longer, thicker needles to begin with as they go further into the wool and catch more fibers. As the wool tangles together it gets more difficult to push this needle into it, so change to a finer one. Use the most delicate tips, with the notches closer to the point, to finish your project by smoothing out the surface and eliminating the "fuzzies". If you do want a fuzzy effect, you can use a Reverse needle which pulls fibers out of the work to give a fluffy finish. I have divided the types of wool into various categories. This is ideal to start your project. It felts easily and is often cheaper than finer wool. This "core wool" is used for the center of your sculptures. Coarse in texture, the fibers lay in various directions aiding the formation of felt. This can come in a batt, lifted off the carding machine in a loose sheet or a roving, where the wool has been passed through a cylindrical channel forming a rope. The longer, finer wool is combed (or carded) so that the fibers run in the same direction, making them smooth. Often called tops, (short for top quality) a large array of dyed and natural colors are available. If you try to learn how to needle felt with long fibers you will find it a much more difficult process! They take more time to compact, therefore are best used for surface work or wet felting. Sheep's wool varies! Some breeds produce softer fleece than others. On one end of the scale are the Herdwick, which have a coarse coat, at the other is the Merino, which are extra soft. Each has its own purpose when creating felt. Other breeds, such as the Wensleydale, have wavy fleeces. These are fantastic for doll hair or animals with curly locks. You can felt fibers from other creatures, such as alpaca, camels, angora goats, and rabbits. Even dog fur will work if you blend it with wool. I do suggest starting with wool though, for its ease of use. 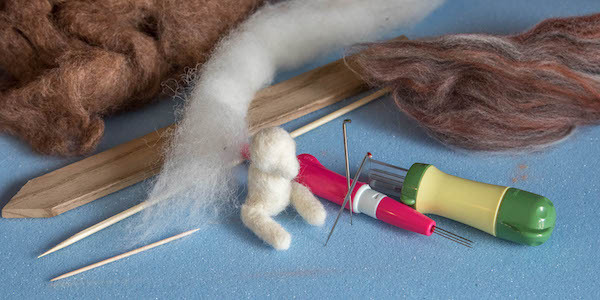 Needle felting needles are delicate and stabbing them through wool onto a hard surface is likely to damage them, so you will need something to cushion the tips as you work. High-density upholstery foam is the most popular surface, but you can buy special needle felting brushes where you work on top of the bristles. You will soon discover your own preference. 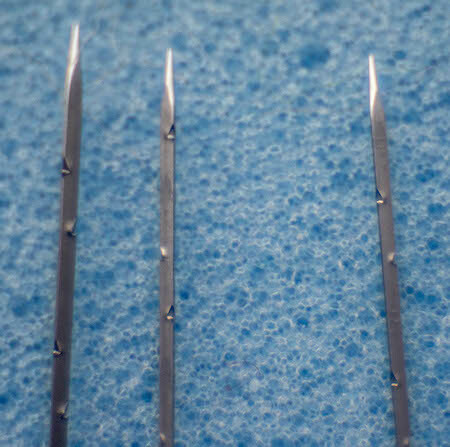 The needles used for felting were manufactured for industrial machines. This can make them difficult to hold. You may prefer to try out one or more of the handles that are now available which hold single or multiple needles. The clover tool holds one, two or three needles which you can replace if you need something finer. As comfortable as a pen to hold, they are useful for both 2D and 3D felting. A punch tool holds a larger number of needles, making quick work of flat pieces of felt. When creating realistic sculptures you may find it necessary to mix colors. To do this you need two paddles or hand carders. These have wire "teeth" which grip hold of the fibers, helping them to align with each other and blend together. For small amounts, you may find you can get away with dog brushes and save money for more wool! For certain shapes, it is helpful to have something to wrap the wool around before stabbing it. You can use many everyday items you have around the house, such as wooden spoon handles, skewers, toothpicks or cocktail sticks. You may like to sand wooden items before using them to ensure the wool slides off without catching on any rough sections. Ready to try needle felt? 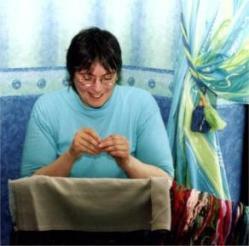 With all the necessary materials and equipment at hand, you are ready to embark on a new, addictive form of needlework. Don't blame me if you become addicted though! 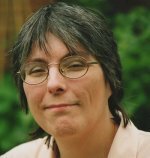 I will be adding more pages to this brand new section of the site, so you may wish to bookmark the page and revisit soon.